Tidy away books, trains and craft supplies. Great for your little one's treasures, or as a catch all for the family. 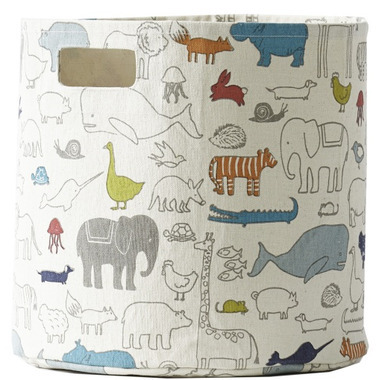 This Petit Pehr Noah's Ark Bin was developed around the classic children's story, Noah's Ark. All bins are 100% cotton canvas and 13D" x 12H". Good quality canvas and I adore the print. We use it for my toddler son's toys. It's a bit pricey, but it does make tidying up a little more enjoyable.